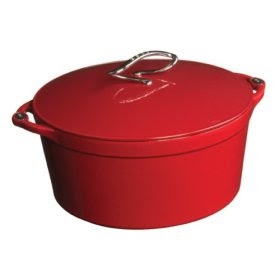 Farmgirl Fare: Super Sale On My BelovedLodge Enamel Cast Iron Dutch Oven! Lodge Enamel Cast Iron Dutch Oven! We interrupt this food and farm blog to let you know that if you've been thinking about buying a 7-quart Lodge enamel cast iron Dutch oven, now's the time. Although I still haven't gotten around to posting recipes for the delicious things I've made in mine since receiving it as an early Christmas gift last year, believe me when I tell you that this baby cooks like an absolute dream. I've been impatiently waiting for summer to end so I could pull it out and get back to slow cooking all those wonderful, wintery, cozy comfort food dishes like beef short ribs and lamb shanks (which I made last week while my mother was visiting). Dutch ovens are ideal for the busy/distracted/disorganized cook or farmgirl; there's nothing like knowing that if dinner ends up cooking for an extra two or three hours that it's only going to taste even better. And you don't even need to follow a recipe to make a fabulous meal. Once I simply browned a few packages of what our butcher had labeled boiling beef (from one of our own grass-fed steers) in olive oil, smothered them with lots and lots and lots of sliced onions, popped the lid on, and put the whole thing in the oven for about five hours. After devouring a large serving of the melt-in-your-mouth results I couldn't believe there wasn't more to this dish. Time and a good Dutch oven are the secret ingredients. So why am I mentioning all this now? Because I just happened to notice that Amazon.com has the 7-quart Lodge enamel cast iron Dutch oven on sale for an amazingly low $99.99, with no tax and free shipping. The list price is $197.99, and Amazon.com normally sells it for $164.99. I have no idea how long the sale will last. The other day I got all ready to tell you about how my favorite bread pans were on sale, and an hour later it was over. It's definitely an investment, but this beautiful Dutch oven should last a lifetime. I know I plan to keep mine forever. It would also make a very special gift, and the gorgeous red couldn't be more festive. It's also available in a stunning dark blue and a bright apple green. And now back to our regularly scheduled crazy farm life programming. Hmm. It just so happens that I am cooking a pot roast in an inappropriate pan in the oven even as I type. I was wondering are those pots really worth it, i used to have a cheap one from a discount store and it was very slow to heat up and even slower to cool dow so it wasnt very good for careful cooking, it always boiled even if you turned off the heat. do the more expensve ones really make a difference? I agree that such pots can do wonders for baking: while I do not have the one pictured (I am living abroad), I know that the one I use allows the meat to cook in its own juices, and with little seasoning comes out just so tasty! May I take this opportunity to express my fan sentiment for this site. I came across it looking for pesto recipes, and as a result of the pizza stone pizza blog, I am trying to order my own baking stone. I also enjoy cooking, and had to move abroad to realise that I too like making winter store. If you want recipes (though it is too late in the year now) for roast pepper salad that keeps through winter, let me know. I was thinking of this site when I read Rabindranath Tagore's "Glimpses from Bengal". If it is not too cumbersome, I will just cut and paste that extract, in case you are interested in affirming reasons why certain life choices are worth it! untrammelled with everyday burdens, may tempt us; but these are illusory." Thank you! Just bought the green apple one. "I am going to learn to make bread to-morrow. mixing flour, milk, saleratus, etc., with a deal of grace. the staff of life to learn with dispatch." Have a great day I enjoy your blog so much! I would love to have an enamel pot because they are so pretty. I have several regular black cast iron dutch ovens and they work wonderfully. I wouldn't be without them! Thank you for all your recipes! 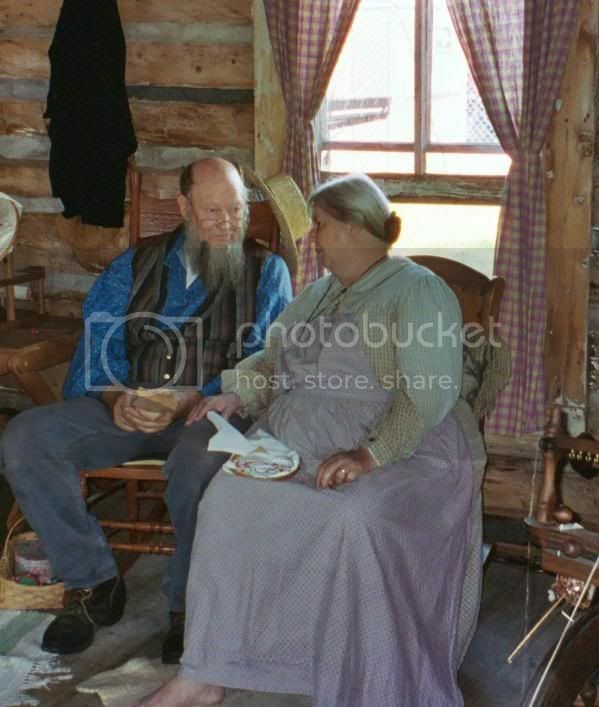 I think I'll put something in now (noon) for supper, since I have to leave for town. Thanks! Funny, FarmGirl, but I was *just* about to e-mail you and ask your advice on purchasing a Dutch oven. And now I have your answer! :-) Great timing. Thank you for posting this! I have a 5-qt and have been coveting the larger ones... I went and bought it as soon as I saw your post - what a deal! Time and a dutch oven...I don't have the time, unfortunately, except on weekends. My crockpot helps some. Lordy this was just what I have been waiting for; cruising Ebay for one of these has become a minor pastime and this is a way better deal than anything I saw there. Wa-hoo! ok...your mother came to visit again and you didn't invite me??? I know you cook all that yummy food when she visits. I know you enjoyed her visit. That blue is gorgeous. It wasn't available when I got mine, or it would have been a tough decision between it and the red. It sounds like maybe you're expecting the wrong kind of results from your Dutch oven. One of the main reasons cast iron has long been so popular is because the heavy, thick metal allows for heat retention and even heat distribution. A cast iron pot is going to take a little while to heat up, and then it'll hold that heat--so if the contents are already boiling, yes, then they would probably keep boiling after you turned off the heat (or even took them completely off the hot burner). Thanks for your kind words. I know you're going to love your pizza stone. We had pizza last night and Joe said it was one of the best I'd ever made. Nothing special about it except top quality ingredients, homemade dough--and that 500 degree baking stone! A roast pepper salad that keeps through the winter sounds wonderful. I would definitely be interested in the recipe. I had a pretty small pepper harvest this summer, but I have high hopes for next year. And thank you so much for the excerpt from "Glimpses from Begal." It's absolutely beautiful--and so true! What great timing. I love it. You're very welcome. I bet you're going to love the 7-quart. I'm so glad I went with the larger size. When I was trying to decide between 5 and 7-quart, a friend assured me that he cooked meals for six in his 5-1/2 quart. But since my motto in the kitchen is More More More! bigger usually works better for me when it comes to cookware. Several years ago I was about to invest in a high dollar non-stick skillet that I mostly wanted for cooking scrambled eggs for myself. I was all set to buy the 8-inch size, but the girl at the kitchenware store convinced me that the 12-inch skillet was the way to go. I said I only needed to cook eggs for myself, and she said, "There's no reason you can't cook just two eggs in a big skillet. And think of all the other things you'll be able to use it for, too." I'm so glad I listened to her. I've used the heck out of that big pan! As always, I thank you all for taking the time to write. I love to hear your stories and always appreciate your feedback. I hate to burst your bubble, but... I got 1 at Sam's Club last year for about $60. Wow, that's a great price if it was for an actual Lodge 7-quart enamel Dutch oven. I do know Lodge had a big price increase several months ago (I'm guessing due to the high cost of gas and the skyrocketing price of anything made out of metal--you wouldn't believe how much fencing supplies have gone up). I love my Le Creuset enameled cast iron stockpot -- didn't know Lodge even made them. I've never seen them at their outlet store in S. Pittsburgh, TN. Maybe I was too busy drooling over all the other goodies they have! It's way past time for some news about, and new photos of, CARY! I'll post an update soon, I promise. No, really, this time I mean it. And don't worry, I haven't been putting it off because there's anything wrong. Cary is as cute as ever (though there's lots more of her than there used to be) and is doing just great. I swear by everything produced by the Lodge folks--it's fantastic cookware as opposed to the flimsy stuff with the more "elegant" looks. Every serious cook should have Lodge products in their kitchen! Thank you so much for the tip! It is now the number one item on my Amazon Wish List. C'mon fambly! Buy me the Dutch oven! I got a bright red Lodge for Christmas last year as well! Hubs listened:) It has become the new love of my kitchen life. I don't know how I got along with out it! Have you tried both the Lodge Enamel & Lodge Color lines (much less expensive with diff lid knob)? Is there a big difference in quality and cooking between the two. Can't find any online information on this.